tested. CRT optimization based on ventriculo-ventricular delay (VVD) settings according to the narrowest QRS complex on ECG after implantation, and the difference between biventricular pacing and pre-implantation ECG, as tested by Vidal et al. showed a good correlation to echocardiographic parameters, but did not supply data on improvement of LVEF or reverse remodeling9. Some studies suggest that echocardiography can help optimize resynchronization settings in non-responders. Attempts have been made for echocardiographic optimization, because of its affordability and large availability. Ritter’s method, measuring largest stroke volume or residual LV dyssynchrony had only mild benefit in comparison to standard CRT settings10-12. 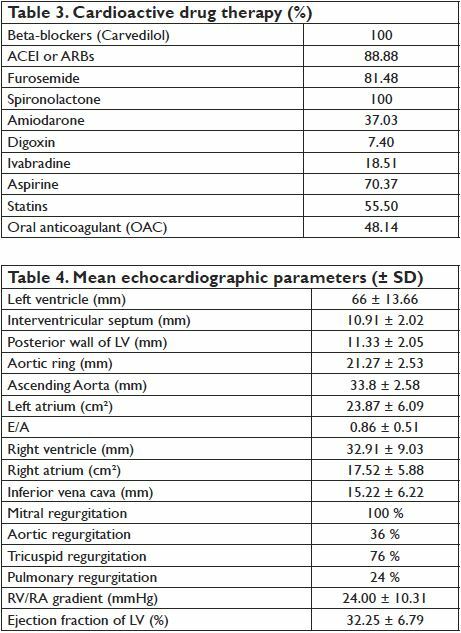 The aim of this study was to assess whether two echocardiographic parameter (Mi and Ao-VTI) can help to optimize CRT settings and to establish which of these parameters is the most efficient. The authors have chosen to assess mitral and aortic VTI parameters because they refl ect the global function of the left ventricle and do not require special technical background or training, thus they are largely available. SPWMD (septal-to-posterior wall motion delay) is obtained in parasternal short axis sections at the level of papillary muscles in 2D guided – M mode – Mi-VTI (mitral velocity-time integral): determined by pulsed wave transmitral velocity curves, from apical four chamber view, as shown in Figure 1. – Ao-VTI (aortic velocity-time integral): determined by pulsed wave Doppler method at the left ventricular ejection tract, below the aortic valves, from apical 5 chamber view, as shown in Figure 2 – dp/dt: measured based on the CW Doppler curve, where mitral regurgitation was present – LVEF was determined using Simpson’s biplane method from apical four and two chamber views – GMI (global myocardial index): calculated as the sum of IVCT and IVRT, divided by ET, according to the formula: GMI=(IVCT+IVRT)/ET, measured by pulsed wave Doppler, from apical 5 chamber view. The study was approved by the hospital’s ethics committee, written informed consent was obtained from each of the enrolled patients. Figure 1. 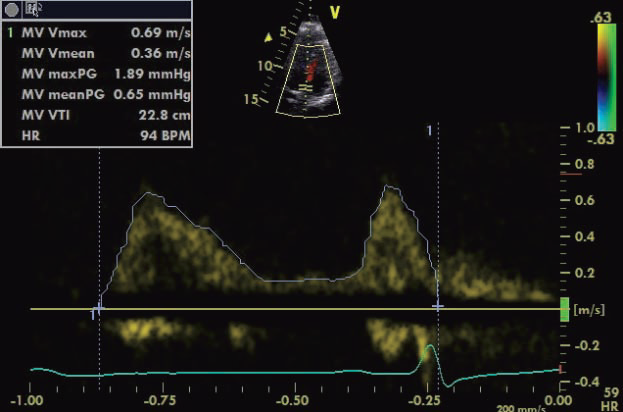 Echocardiographic measurement method of Mi-VTI. Figure 2. 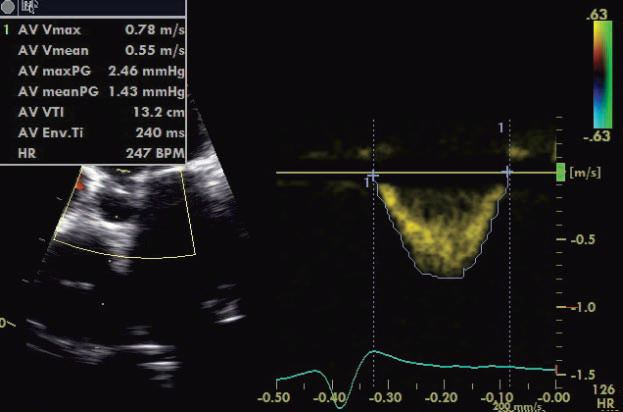 Echocardiographic measurement method of Ao-VTI. the statistical (p) values for these dyssynchrony parameters. Figure 3. 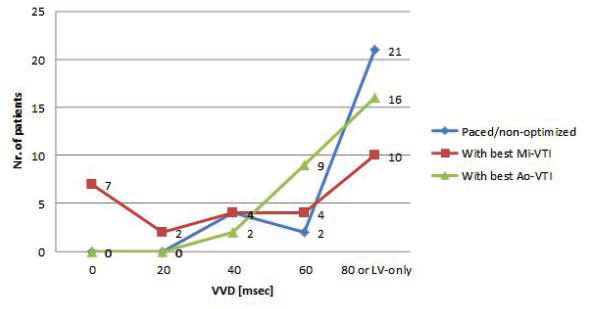 Distribution of the atrio-ventricular delay under the three settings. and GMI after optimization with Mi-VTI). Based on this case series, echocardiographic optimization of cardiac resynchronization therapy using Mi and Ao-VTI parameters showed no benefi t and should be considered only in individual cases, especially in non-responders to CRT with standard pacing settings, perhaps correlated with other optimization methods, such as TDI Doppler imaging techniques using myocardial strain and strain rate 13 and cardiac MRI, which can help better identify patterns of dyssynchrony 14, although these methods have limited applicability due to their lack of availability and high costs. placement and targeting latest activated area showed likely benefi t by reducing hospitalization for HF and improving the rate of responders17-20. Our results correspond partially with findings from the literature, which in itself consists of controversioptimizatial conclusions in this fi eld. 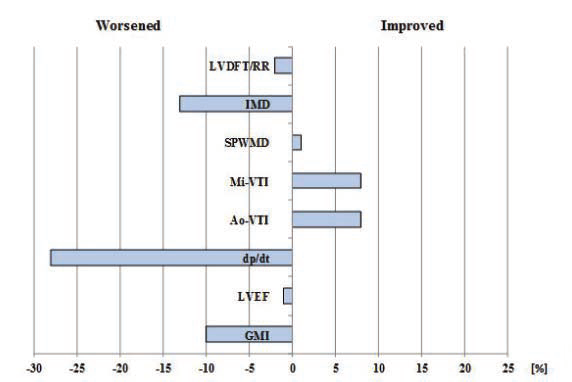 Small randomized clinical trials and experimental studies found improvement in the left ventricular systolic function, heart failure symptoms, reducing hospitalizations and a positive change in the quality of life after optimization with AV and VV delay. Sawhney et al. 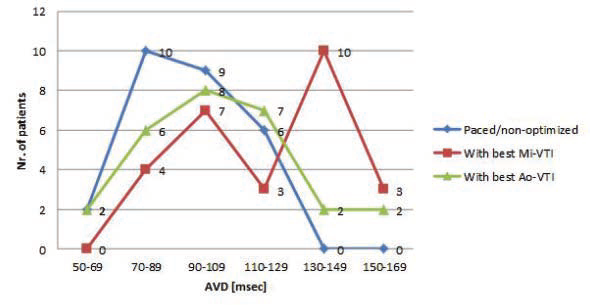 have identified that AV delay optimization using the aortic-VTI improves the three-month clinical outcome more than a 120 ms programmed empiric AV delay10. Similar results were described by Kerlan et al., who compared echocardiographic AV delay optimization guided by the aortic- VTI versus the mitral inflow method and concluded that AV delay optimization with aortic-VTI for patients with severe heart failure, provides considerably more improvement21. Other studies emphasize the importance of mitral-VTI. Jansen et al. and Thomas et al. had similar findings when comparing the use of mitral-VTI to aortic-VTI guided optimization, claiming that the mitral- VTI method is reliable and affordable in everyday clinical practice and adequate in improving response to CRT15,22. Figure 5. Percentual improvement of dyssynchrony parameters with basal- paced CRT rhythm compared to native rhythm (with the CRT device turned off). Figure 6. 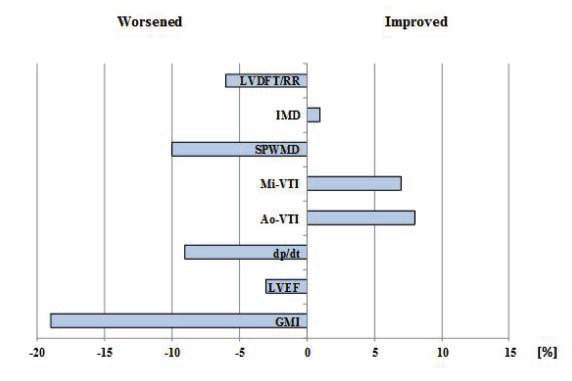 Percentual improvement or worsening of LV dyssynchrony parameters, after optimization with Mi-VTI compared to basal-paced setting before optimization. Figure 7. Percentual improvement or worsening of LV dyssynchrony parameters after optimization with Ao-VTI compared to basal-paced setting before optimization. 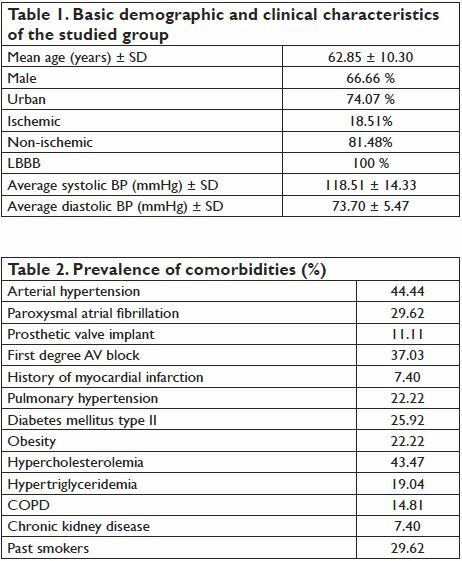 Contrarily, results from large multicentre trials, that assessed the utility of aortic and mitral VTI for optimization of CRT, showed no signifi cant benefi t compared to other optimization methods. 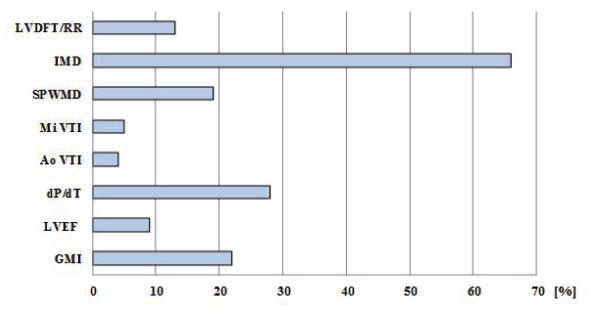 According to the FREEDOM23,24, CLEAR25, SMART-AV12, Adaptive CRT26,27, DECREASE-HF 1 and Responde CRT28 trials, the difference of benefi ts between automatic electrical, devicebased algorithms (SmartDelay and QuickOpt for AV delay and Expert-Ease, Quick-Opt, Peak endocardial acceleration for VV delay-based optimization) and echocardiographic CRT optimization remains uncertain. Correspondingly, our results suggest that AV and VV delay optimization do not provide improvement in echocardiographic parameters of patients with CRT. associated with other optimization methods. 29. Daube rt C, Behar N, Martins RP, Mabo P, Leclercq C. Avoiding nonresponders to cardiac resynchronization therapy: a practical guide. European heart journal. 2016 Jul 1.